Today, I’m so pleased to have Chiara Arroyo here with a guest post! She’s co-owner of the wonderful L.A. bookstore, LA librería, which carries Spanish-language children’s books (and has a terrific online store). She’ll be sharing 11 Spanish-language books from small presses to help you build your bilingual library. Over to Chiara! So happy to have her! I don’t recall seeing so many beautiful books as a child as there are now. 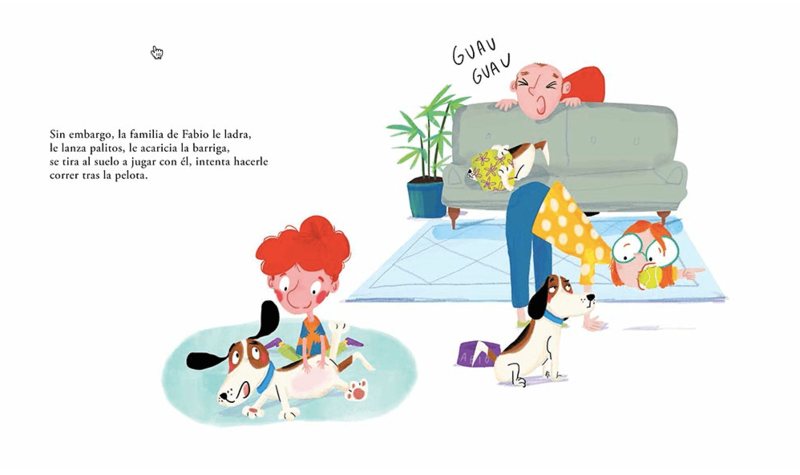 As a book-lover and bookseller who travels seeking quality children’s books in the Spanish-language, I have noticed lately the flourishing of independent publishers in Latin America and Spain. These small presses offer a diverse and refreshing perspective into the children’s literature panorama. They opt for new authors and illustrators with unique voices and experimental styles. They seek to connect with children’s experiences and taste. It is also encouraging to see how these small presses understand the book as a uniquely crafted and valuable object, made with care, and worthy of being part of a private collection. 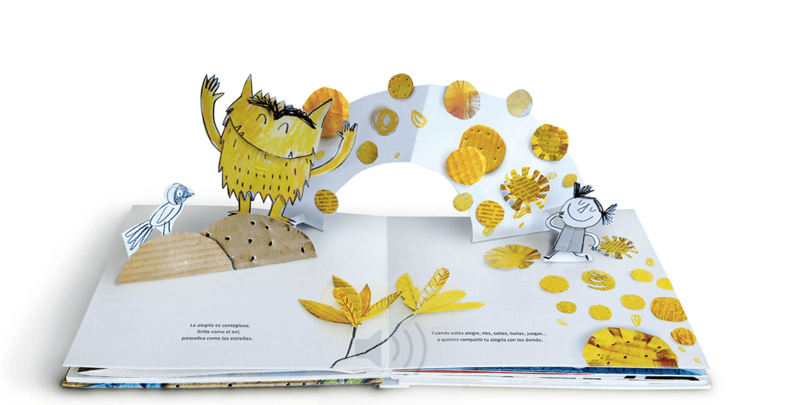 The visual art within these books is so powerful that they break the boundaries of language such that it has even drawn the attention of adults who are not parents or Spanish speakers. As the Spanish-speaking population of the United States grows, as you probably already know, the offer of books originally written in Spanish, also called “authentic” literature, is finally expanding. 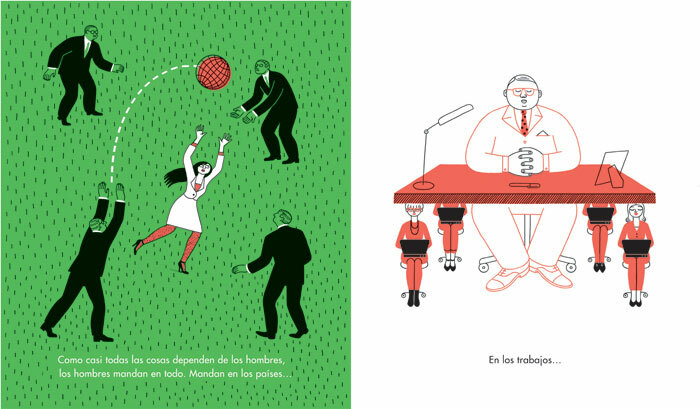 Although LA librería is devoted to exactly that, what I find especially interesting is that several of these stories have been translated and are now available in English, reaching many more readers. 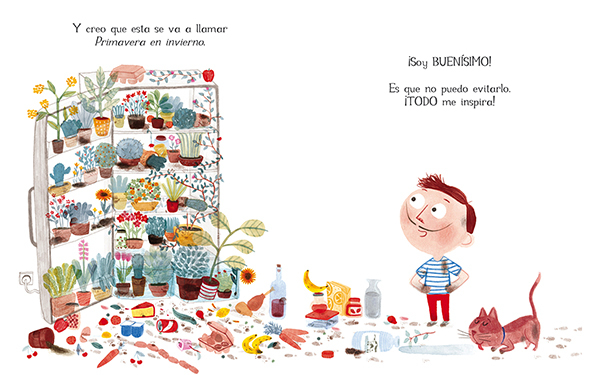 Surrounded by all of these beautiful books, I invite you to observe, get intrigued and finally delve into the magical world of children’s literature from the Spanish speaking world, as everything else around you disappears and becomes silent. Todas las cosas / So many things. By Maya Hanisch. Published by Amanuta. Amanuta is a renowned independent publishing house from Chile that combines traditional with contemporary literature and has an exquisite taste for illustration. This bilingual book is a clear example. Created by one of our favorite authors, Maya Hanisch, also from Chile, it invites us to explore this marvelous inventory of everyday objects represented with collage technique and a striking color treatment. Let yourself enjoy every single detail and also note the Chilean regionalisms found throughout the book. NI GUAU NI MIAU / BOW WOW MEOW. 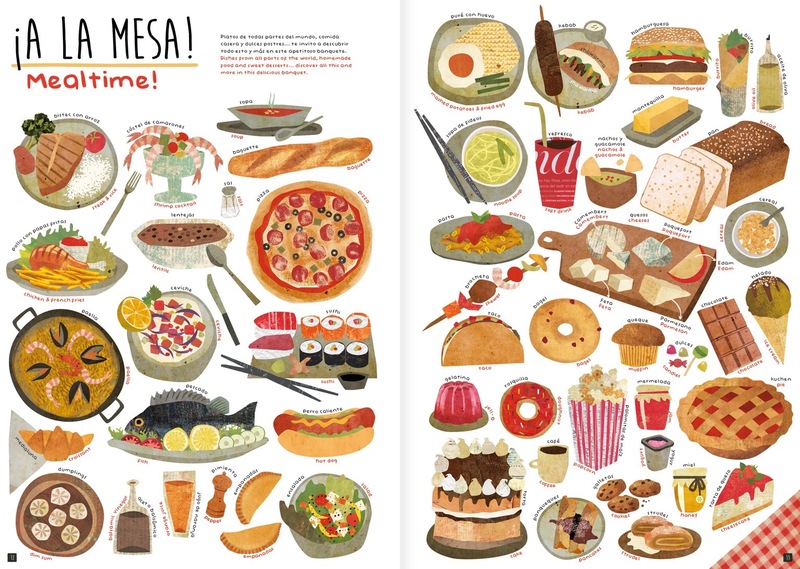 By Blanca Lacasa and Gómez. 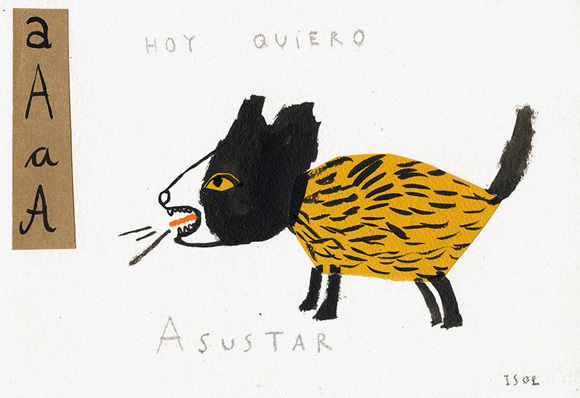 Published by Nube Ocho. 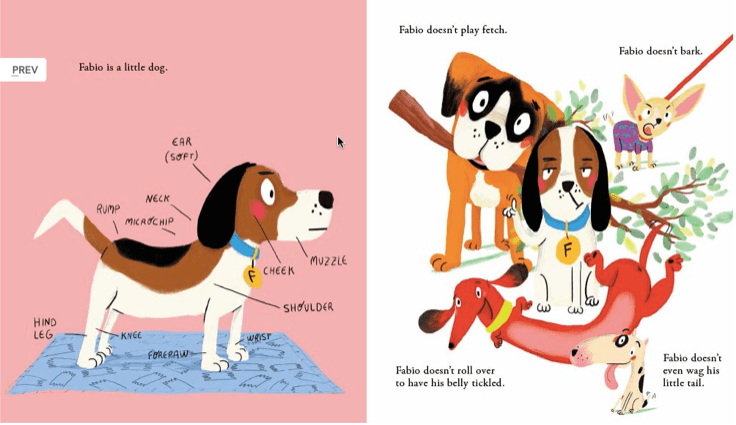 This charming and funny story has a dog called Fabio as a main character. But Fabio does not want to do what other dogs do. “This is a story about being yourself and understanding others. 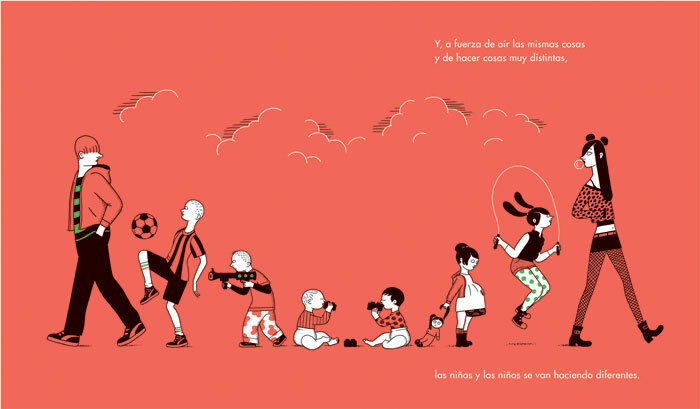 I started Nube Ocho to give children the opportunity to talk and think about specific and important topics such as the equality of girls and boys, diversity, inclusion and self-esteem,” Luis Amavisca explains as editor and co-founder. This young and small press house from Spain is one of the few publishers that took the brave decision to offer a catalog of titles in Spanish, English and Italian, with great success so far. Barcelona. By David Pintor. Published by Kalandraka. 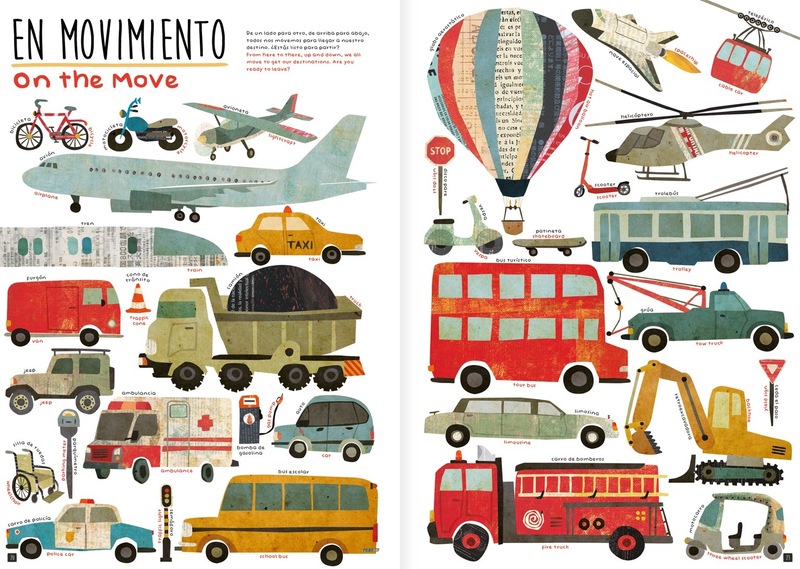 This wonderful picture book captures the magic of the city where I was raised. The book takes the reader on an illustrative journey from the streets, to the balconies and rooftops in which the author discovers life behind colorful mosaics, Gaudi’s dazzling buildings, the blue Mediterranean Sea, the Gothic Quarter and calm coffee shops. As I look at the pages, I can picture clearly David Pintor on a bike, stopping time to time to draw in his dear Moleskine notebook. His travels are the inspiration of his work and this book is an invitation to encounter this unique city. 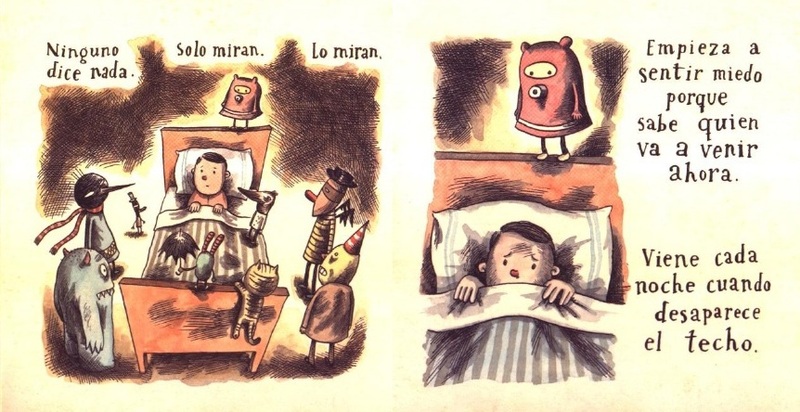 Lo que hay antes de que haya algo / What there is before there is anything there: a scary story. 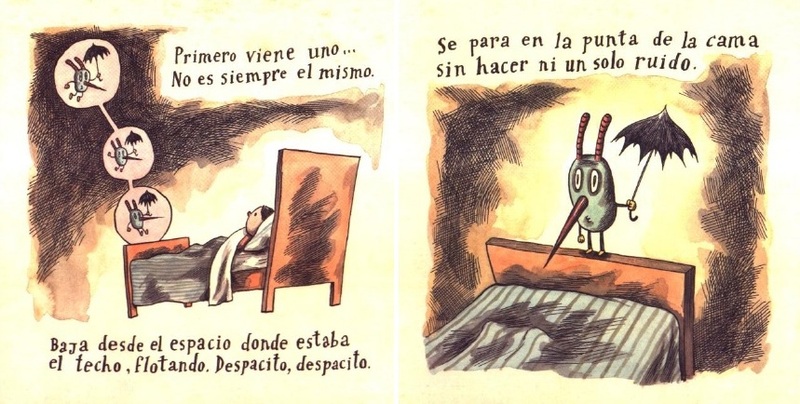 By Liniers. Published by Pequeño Editor. In this story, a boy’s imagination comes to life at night when he is taken over by his fear of the dark. Creatures begin to form and surround his bed. However, the creature that scares him the most has no shape at all. 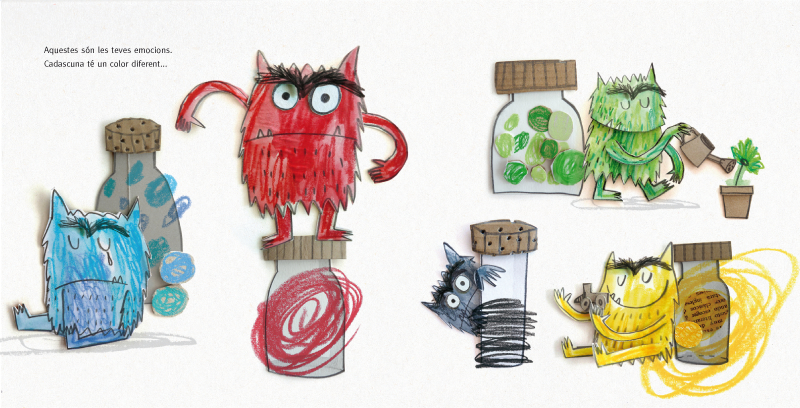 The illustrations go hand in hand with the text as words and language transform into creatures of the imagination and build suspense until the very end. A story that connects with many children and adults too. La composición/ The composition. By Antonio Skármeta and Alfonso Ruano. Published by Ekaré. 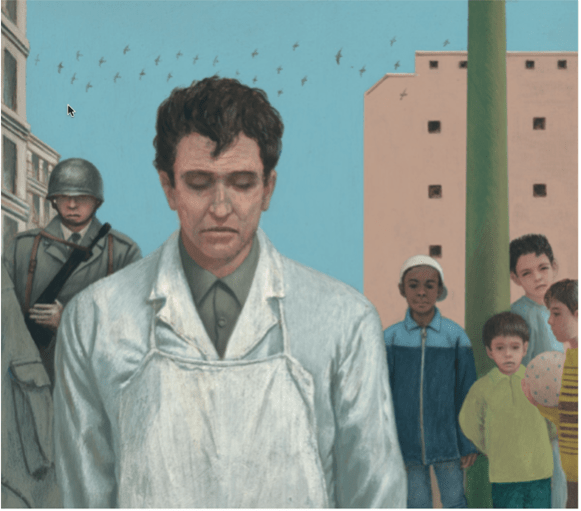 This timely picture book by Chilean writer Antonio Skármeta presents a situation all too familiar to children around the world. It also provides readers with food for thought about freedom, moral choices and personal responsibilities. El día en que me convertí en pájaro/ They day I became a bird. By Ingrid Chabbert and Guridi. Published by Tres Tigres Tristes. 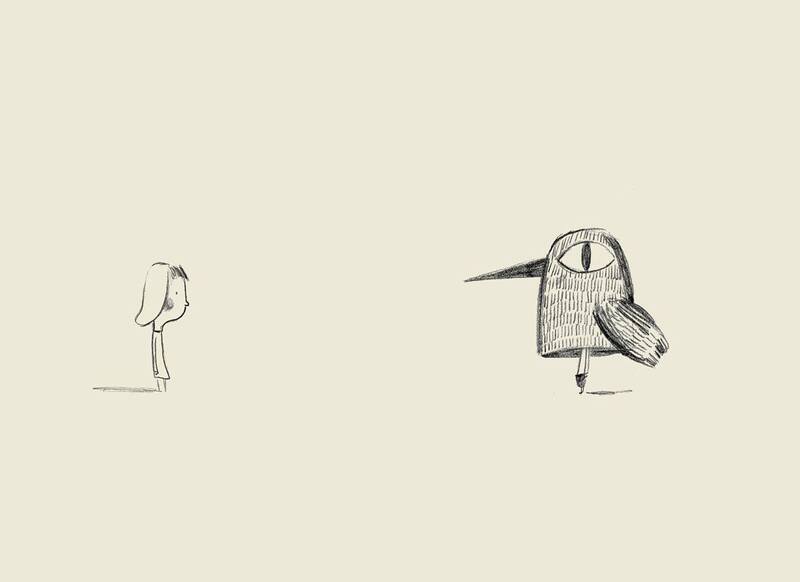 The main character of this delicate story falls in love with Candela the day he starts school. Candela loves birds. So, in order to gain her attention, the little boy decides to construct a costume that would transform himself into a bird. He endures the stares and giggles of his classmates, and a great deal of discomfort, but the boy doesn’t care. What wouldn’t we all do to be noticed by the person we love? French author Ingrid Chabbert perfectly captures the emotional essence of a child’s first love. And the minimalist black and white drawings of Spanish artist Guridi picture the voices and tender emotions of this sweet and universal discovery. Las mujeres y los hombres / Women and Men. By Equipo Plantel & Lucy Gutierrez. Published by Media Vaca. This is a book that hasn’t been published in English yet but its powerful illustrations speak for themselves. The editors of Media Vaca decided to republish a series of 4 titles published in Spain in 1978, a few years after the dictatorship of Francisco Franco was over and the year the Spanish Constitution was in place. They thought this title would be the most outdated since many changes have taken place in almost forty years and fortunately always for the better. However, I invite you to verify how much things have really changed. Lucy Gutierrez’s sharp and questioning illustrations make this picture book a perfect vehicle to prompt discussion about gender equality. Dos conejos blancos / Two White Rabbits. By Jairo Buitrago and Rafael Yockteng. Published by Groundwood Books. Together, Jairo Buitrago and Rafael Yocktheng, both from Colombia, combined their talent once again to create a sensitive story that gives voice to the most vulnerable: the children. In this moving and timely story, a young child describes what it is like to be a migrant as she and her father travel north toward the US border on the roof of a train known as The Beast. The little girl doesn’t know where they are going. She counts the animals by the road, the clouds in the sky, the stars. It is through her eyes readers will understand the arduous journey thousands of people take in search of a better life. Soy un artista /I am an artist. By Marta Altes. Published by Blackie Books. This is the hilarious story about an innocent little boy who can’t stop creating art and his mother who isn’t quite so enthusiastic. In fact, she seems a little cross! But this boy has a plan to make his mum smile. 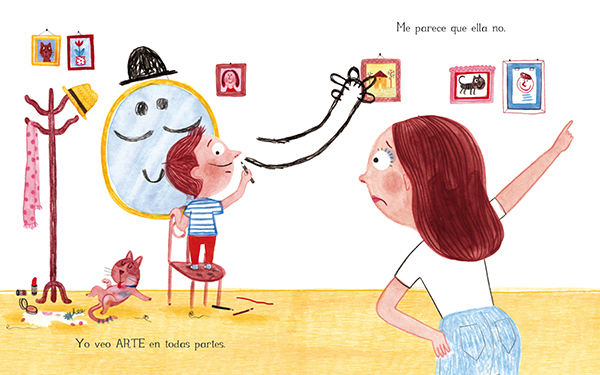 He’s about to create his finest piece yet and on a very grand scale … I love the sharp and expressive illustration of Marta Altes and the truly inspirational message of this story that appeals to children and parents. Art is EVERYWHERE! El monstruo de colores. The color monster. By Anna Llenas. Published by Flamboyant. This cute monster is confused. He does not know what is going on. Fortunately, his smarty friend will teach him how to deal with emotions. Anna Llenas’ colorful and joyful illustrations help children recognize when they feel happy, angry, sad, scared and calm by equating it with a color. A final emotion is left unnamed for readers to identify, but pink hearts give it away. Don’t forget to take a picture of your child when you open the pop-up version! Abecedario a mano / A Daytime Visions. An Alphabet. By Isol. Published by FCE. Chiara Arroyo has a Master’s Degree in Journalism and is the cofounder of LA librería, a Los Angeles-based bookstore and distributor specialized in children’s literature in Spanish-language. Five years ago, she and her partner Celene Navarrete decided to start this adventure to fulfill the lack and need of quality books from Latin America and Spain among families raising bilingual and multicultural children in the USA. Visit LA librería at 4732 ½ W Washington Blvd. Los Angeles, CA 90016 or online at www.la-libreria.net. 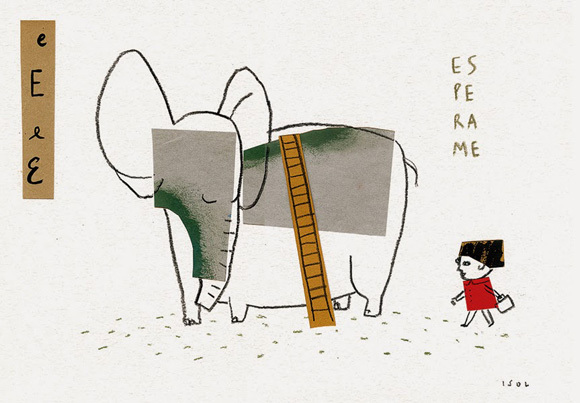 Finally, you might also be interested in my first collaboration with LA librería, ISOL’s picture book life! ← zinnia and the bees cover! There are so many great Latin American and Spanish books! I’m glad that some are getting translated and published in the States. Yes, me too. Here’s to more! ¡Y ojalá LA Librería abriese también un local en San Francisco! ¿SF Librería? What a timeless and timely collection of books all so thoughtfully narrated and illustrated. I will look for them in our local library and I can imagine a couple in our home library. That’s so good to hear! I’m grateful to Chiara for sharing these.